One proposed benefit for the seemingly costly behaviour of food calling is the recruitment of social allies and mates by the signaller. In chimpanzees, food calls are only produced for approximately half of all feeding events. Therefore, we investigated the influence of social and ecological context on the probability of making a food call upon arriving to a food patch in a group of wild chimpanzees. First, we tested whether feeding events where food calls had been uttered did in fact attract more individuals to join the caller. Secondly, we examined the influence of two sources of audience effects: those who were physically present with the caller and those who were presumed nearby but out of sight, and thirdly the effect of various ecological factors. We found that when feeding on fruit species, events where food calls had been produced had a higher probability of group mates arriving, even whilst controlling for the effect of pant hoots. Furthermore, the probability of uttering a food call was motivated by social more than ecological context. 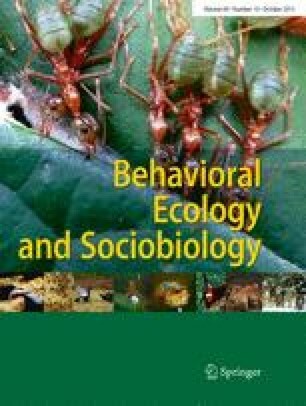 Specifically, high-ranking males were more likely to make food calls when estrous females were nearby, while low-ranking males and females generally called more when more females were nearby, irrespective of their reproductive state. These effects were independent of the increase in food call probability when male callers were accompanied by more males. Our findings support the recruitment function of food calls and suggest that high-ranking males call to attract estrous females to food patches to obtain mating opportunities. The online version of this article (doi: 10.1007/s00265-015-1982-1) contains supplementary material, which is available to authorized users. This study was funded by the Max Planck Society. We thank the Ministère de la Recherche Scientifique and the Ministère de l’Environnement et des Eaux et Forêts of Côte d’Ivoire and Office Ivorien des Parcs et Reserves for permission to conduct research in the country and Taï National Park. For logistical support, we thank the Centre Suisse de Recherche Scientifique and the Taï Chimpanzee Project, especially all field assistants and Roman Wittig. Thanks to Cathy Crockford for comments on earlier drafts as well as Roger Mundry and Colleen Stephens for statistical support. We also thank two anonymous reviewers for helpful comments that improved this manuscript. This research was conducted with permissions from the relevant Ivorian authorities in accordance with the national laws and animal care regulations of Côte d’Ivoire as well as Germany. The study complied with the ethical standards of the Max Planck Institute for Evolutionary Anthropology and the Primatology department’s ethical guidelines for non-invasive research.